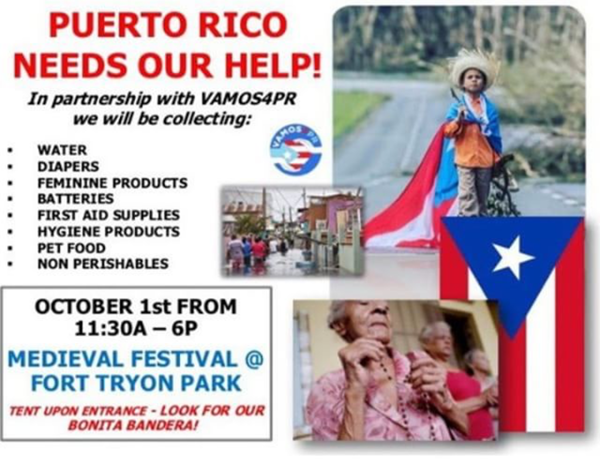 The good folks behind the Medieval Festival as well as several organizations have teamed up to help our brothers and sisters in Puerto Rico. Things were bad on the island before they got hit with back to back hurricanes but now things are catastrophic. The people of Puerto Rico have an indomitable spirit but they are in dire straights and need our help post-haste. Stop by the tent at the entrance of the Medieval Festival and please donate what you can. If you can’t make it, please consider donating to the Hispanic Federation at hispanicfederation.org/donate.